This is exciting. Why read dry business books when you can pick up the equiva­lent of an unputdownable John Grisham-style thrill read? Even better when the story is real, as in the $10-billion legal battle over oil spills in the rainforest of Amazonian Ecuador. 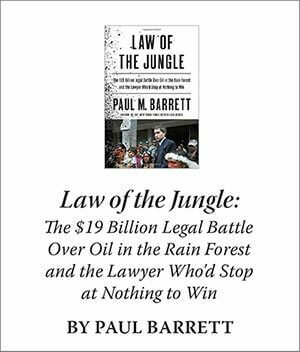 Law of the Jungle is Paul Barrett’s telling tale of young lawyer Steven Donziger and his “obsessive crusade – waged at any cost” to bring an oil giant to justice for environ­mental crimes that go back decades. The giant in focus is Texaco (now part of Chev­ron), which drilled the rainforest and left 400,000 barrels of oil in toxic ponds, poi­soning rivers and the people who lived on them. (Chevron maintains it met all clean­up obligations and that Ecuador released it of liability in 1998). It’s even more exciting when you’ve been to the scene of the crime. I visited Amazonian Ecuador in 2009 as a guest of the Rainforest Alliance. While there, I saw these toxic ponds and met the people af­fected by them. I also learned how these people were trying to maintain a life on the rivers and in the forest that didn’t involve working for the oil company. The damage is real and continues to this day as oil com­panies drive deeper into the national parks and lands of the Yasuni people. Steven Donziger was a single man who was up against one of the world’s biggest corporations. The most surprising thing is that he wasn’t squished like a bug years ago. This was a corporation that could have properly treated the waste it created for a couple of million dollars in 1980. In doing so, it could have avoided spending many times that amount on lawyers and investi­gators over the past 20 years as it attempted to shut Donziger down. Instead, Donziger went from success to astonishing success, winning a $9.5-billion (U.S.) judgement in Ecuador and cutting a swathe across the world as he tried to tie up Chevron assets from Argentina to Ontario. He turned Ecuador into the centre of the environmental universe, with Bianca Jagger, Daryl Hannah and Al Gore as bit players in the drama. Donziger knew how to play the media, the Ecuadorian courts, and public opinion; he was on a roll. That is, until it all fell apart last March in New York, where U.S. District Judge Lewis Kaplan called the Ecuador judg­ment the product of “egregious fraud” and imposed an injunction that bars Donziger from keeping any money resulting from the foreign ruling. Donziger has since appealed the ruling. Barrett, it should be noted, is a writer and editor at Bloomberg Businessweek and is no environmentalist. It’s clear he is less interested in the sins of Chevron than the sins of Donziger, who in September filed a “notice of defamation” against Barrett and book publisher Random House. Donziger did appear to overplay his hand and overstep the lines. He is now ac­cused of writing the Ecuadorian judge’s decision himself, fabricating evidence and promising bribes. I could fill out this entire review with all of the exciting legal chica­nery that has been alleged, but that would ruin the fun. Law of the Jungle is a wonderful legal thriller and an easy and entertaining read, but it seems to me that the author can’t see the rainforest for the trees. Texaco and Chevron are long gone, replaced by the gov­ernment oil company Petroecuador. President Rafael Correa, hugely popular among the poor, essentially put a gun to the head of the Yasuni, demanding that the rest of the world put up money to stop oil ex­ploration or the rainforest gets it. The rest of the world said no and the rainforest con­tinues to get hacked away, the rivers con­tinue being polluted and poisoned, and the astonishing disparity between the wealthy and the poor continues to widen. 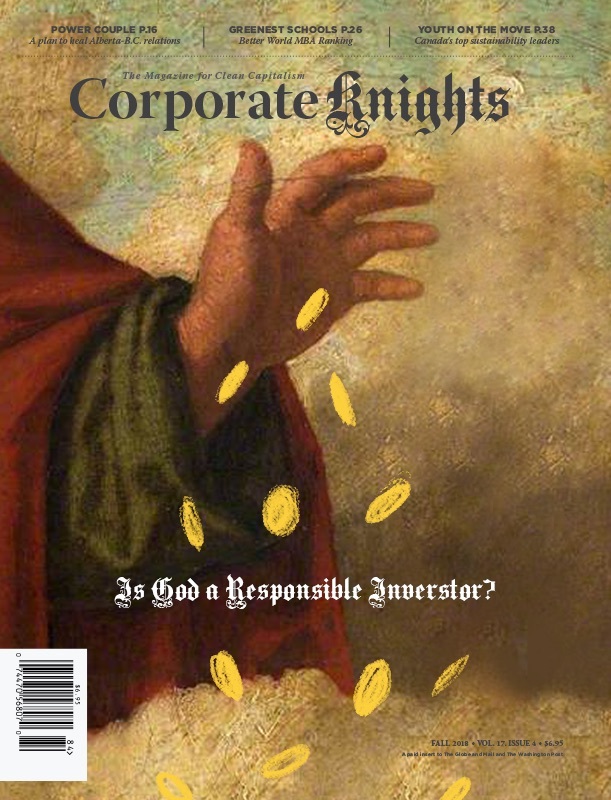 This is a book about a lawyer fighting a big company. The big company is winning, and Donziger has proved to be no Erin Brockov­ich. But there is an important book still to be written about what really happened in Ec­uador, and what continues to happen to the rainforest and the people there.